Catch a rising conservative star! 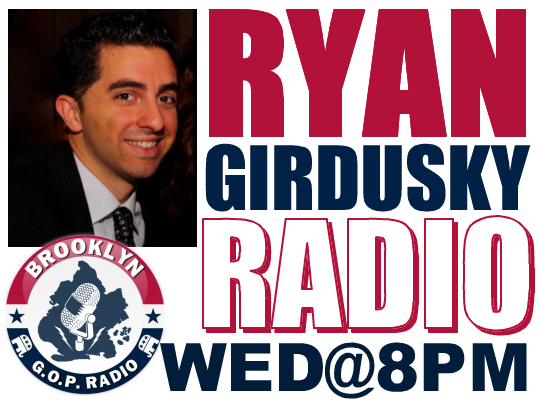 Writer / Consultant Ryan Girdusky takes control of Brooklyn GOP Radio! It's time Brooklyn GOP Radio's audience was introduced to a very talented young man who is going places in Republican circles both locally and on the national front. Ryan James Girdusky is a talented writer from New York City. Ryan has already been published in conservative national publication like American Spectator, Human Events, Christian Science Monitor, Townhall.com. DailyCaller.com, Breitbart.com, and AmericanThinker.com. As a political consultant he has worked on many campaigns including Bob Turner, Eric Ulrich for State Senate, David Storobin for State Senate, and Mayor Bloomberg's re-election. He also was a consultant for Liberty for All Super Pac. Wow. That's a pretty good resume. So for the first time ever, we're handing the reins of the show over to someone else. Ryan is running the show - he's inviting his own guests, he choosing the topics and he's moderating the conversation. Who knows? This might be the start of something big! Tune in Wednesday at 8 PM! Who are we backing in the election this year for Mayor. Would like to hear who and why.